This Detroit Yacht Club Belle Isle spring wedding was absolutely spectacular in the most perfect way. When I think back to that gorgeous day in May, I cannot help but be so thankful for the wonderful people, lucky weather, and stunning couple! Kelsey and Nick are truly one of a kind and the love shared between them melts my heart! The day started out with the threat of rain and this (very) pregnant momma was determined to rock it out, rain or shine! The rain held off and the sun came shining through at just the right moments! I started documenting the day at Kelsey’s home in Northville. Her details were beautiful, but what was more spectacular was the authentic moments captured in the home with her family and bridesmaids. While I was lost in wedding bliss with Kelsey, our very own executive photographer, Nicole, was photographing Nick and the guys at the Detroit Marriott at the Renaissance Center. The Ren Cen is always a fun location to photograph in downtown Detroit. It has a central location and is right next to the Riverfront which always allows for some awesome photographs! Following the precious moments in the morning, we all headed to the ceremony at Our Lady of Sorrows Church in Farmington. The ceremony was filled with rich tradition and meaning. They even received a special, surprise gift. The priest gave Kelsey and Nick rosaries that were blessed by the Pope. They received them with great gratitude and joy! How special!? After the ceremony, we were off to Belle Isle! The raindrops started to fall, but we were determined! Kelsey and Nick and their fabulous bridal party endured all the rain! We took photographs in between rain bursts and umbrellas. It didn’t matter if we were in front of the Belle Isle Conservatory or the fountain. It didn’t matter if we photographed these two in front of the greenhouses or in rain, everything they did looked spectacular! And not to mention that their reception at the Detroit Yacht Club was phenomenal! Their wedding coordinator, Ashley from Festoons and Flourishes, created a greek masterpiece in the ballroom. The room was decorated from floor to ceiling in beautiful greens and details. Kelsey and Nick were shocked as they entered the room for the first time! 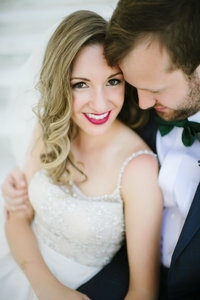 And this location was not only special because of its aesthetic appeal, but Kelsey’s parents were married at the same ceremony and reception location EXACTLY 30 years prior. They celebrated their 30th wedding anniversary with Kelsey and Nick! The evening continued with lots of delicious food and tons of fun on the dance floor! And as the clouds rolled in and the sun was setting fast, Nicole took Kelsey and Nick onto the dock for some beautiful sunset photographs overlooking the Detroit River. Then it was back to the party! Nicole documented family and friends getting crazy on the dance floor! The night couldn’t have ended any better! Kelsey and Nick kicked off our 2017 season! And it was a great start to many more fabulous weddings!